4 April, 2018, Cairo, Egypt: The conclusion of the 7th edition of Cityscape Egypt demonstrated the resilience of the country’s real estate sector as Egyptians responded to the latest residential projects with optimism and vigour. The four-day exhibition, which came to an end on March 31st, attracted a record-breaking number of visitors in what was the largest event in the show’s history. With an 8% increase in visitor numbers compared to last year, Cityscape Egypt also increased exhibition space by 25% at its new venue, the Egypt International Exhibition Centre in New Cairo. “This year’s show was a prime example, as developers offered flexible and attractive payment structures to investors and homeowners giving them a window to settle payments over an extended time, mitigating any housing price challenges in the market,” added Speller. “Following the conclusion of a successful Cityscape Egypt 2018, we turn our attention towards Cityscape Global, which will be held in Dubai from October 2nd until the 4th. This year, we have decided to include a dedicated Egyptian pavilion, which will highlight the wealth of real estate investment opportunities available in Egypt to Egyptian expatriates in the UAE – the third largest Egyptian expatriate community in the world – and international visitors to the show,” concluded Speller. Experts have maintained that over the last year the performance of the Egyptian real estate sector has been encouraging. One of the factors supporting the increased demand for residential property in Egypt has been the maturity of high interest certificates of deposit, according to real estate consultant JLL, which has contributed to the positive investment sentiment seen in the sector during 2018 and realised at this year’s 7th chapter of Cityscape Egypt. The show kicked off on a high note following a visit from the Minister of Housing, Utilities and Urban Development, Moustafa Madbouly, who announced the government’s plans for the real estate sector at the start of the show, revealing that they would be auctioning more than 75,000 land plots next month. The Minister’s visit was then followed by exhibitors launching and providing updates on existing projects across the country. Egypt’s leading developers touted their latest projects, with most developments featuring a strong emphasis on lifestyle and community living, a popular trend in the Egyptian residential market. Exhibitors showcased neighbourhoods complete with community retail facilities, as well as education and healthcare facilities. Some of this year’s most prominent projects included: Coast 82 from Hyde Park Developments; Blues Tiffany from Platinum Sponsor, PROJECTS; Tatweer Misr’s Fouka Bay, Bloomfields, and IL Monte Galala; October Plaza from SODIC; Mousa Coast from Misr Italia; and Talaat Moustafa Group showcased Madinaty and Al Rehab City, in New Cairo, and Four Seasons Sharm El-Sheikh. For many developers, participating at this year’s Cityscape Egypt was a way of showing their commitment to the real estate sector and firmly establishing their presence among Egyptians in 2018. Eng. 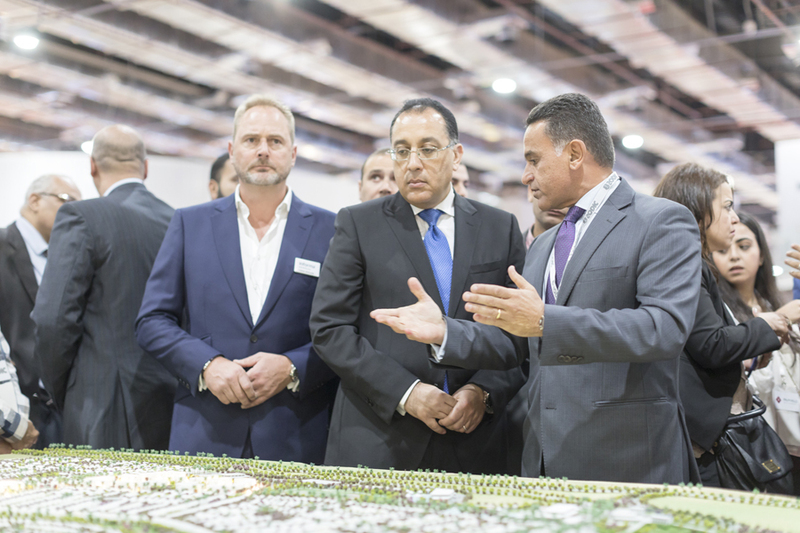 Amin Serag CEO of Hyde Park Developments said Cityscape Egypt is one of the most influential events in the region and it was a natural decision to participate. “Every year, Hyde Park is keen to showcase how our projects are developing at Cityscape Egypt. 2018 is the year of investment and expansion for us,” he said. “Hyde Park constantly drives economic development and considers itself an active player in the implementation of the Egypt Vision 2030,” he added. Ayman Wagdy, Chief Operating Officer at Al Ahly for Real Estate, said Cityscape Egypt has always been a pillar of the real estate sector in the country and they were keen to participate to reach a wide audience and highlight their projects during such a pertinent time. The 8th edition of Cityscape Egypt is set to take place from March 27th until the 30th, 2019 at the Egypt International Exhibition Centre, New Cairo.